Sarah Huckabee Sanders offered the world an internet sourced doctored video demonstrating CNN's Jim Acosta physically chopping at the arm of a White House intern*. The White House then used that video as an excuse to take away Acosta's press pass. Acosta was repeating a question that President Trump did not like, however Acosta felt important to get answered. Journalists try to push the President to answer questions at every press conference. It is their job. Multiple sources have confirmed source video of the actual event, played at normal speed, shows Acosta to be a professional who regarded the intern with respect, while continuing to push the President. The video shared by Sanders is a sham. Meanwhile, back at the White House, damage control was whimpering and hiding in a corner. 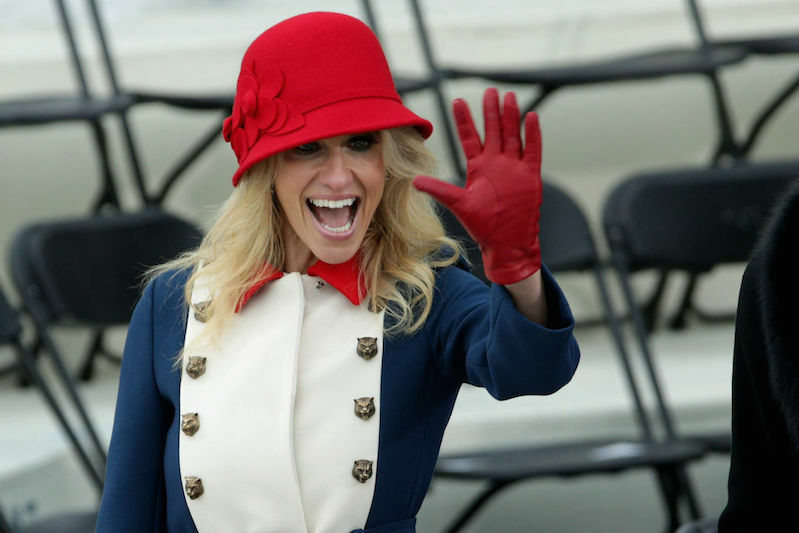 Things became desperate enough to release the Conway. Be prepared to marvel in Kellyanne's logic free-zone. "Oh, well, that's not altered, it's sped up. They do it all the time in sports to see if there's actually a first down or touchdown," Conway told host Chris Wallace on "Fox News Sunday." "So, I'm going to have to disagree with, I think, the overwrought description of this video being doctored as if we put somebody else's arm in there." The video in question was tweeted out by White House press secretary Sarah Huckabee Sanders on Wednesday night in announcing the decision to suspend Acosta's press pass and thus his access to the White House. Acosta and Trump had a tense exchange during a news conference earlier Wednesday, in which Trump called him "a rude, terrible person." Acosta tried to continue asking a question as a staffer attempted to take the microphone away from him — the point at which, the White House claims, he "puts his hands on" the intern. Independent experts have told reporters that the footage is doctored. Multiple journalistic organizations, including the White House Correspondents’ Association, have slammed the move. Acosta has said the notion he put his hands on the intern is "a lie," and CNN has said it stands behind one of its most prominent reporters. Conway also suggests Trump's lickspittle acting Attorney General Whittaker's commentary about the Mueller investigation (it is a horrible crime committed against Orange Julius and the country,) were somehow made as a private citizen and not relevant to his appointment. *Also appears Sanders was lying about the status of the 'intern.' The intern is a paid employee making $130k/year. Why even bother with this lie? Perhaps once Sanders got going she felt like trying to slip a few extras in for good measure? Sad Trump: "I don't have an attorney general"
The FCC is only allowed to change existing policies if they can show evidence of some change in facts, so at yesterday's bomb-threat haunted hearing to destroy Net Neutrality, Trump FCC Chairman Ajit Pai and his Republican colleagues made a pro-forma recitation of the reasons justifying his extreme actions.